"Poll-driven politicians see need to tackle global warming. Lawmakers have introduced more than 60 bills ... polls show widespread support among California voters"
"... Kevin Rudd has signalled a series of domestic and international initiatives to convert Australia into a global leader of the campaign to cut greenhouse gas emissions by 60 percent"
"Gore gets a warm welcome on Capitol Hill, and a few heated exchanges"
Democrat Presidential candidate, Senator John Edwards, has called for cleaner use of coal as part of the fight against global warming. He has called for a ban on any new coal-burning power plant that does not capture carbon dioxide. Following announcement of his plan to halt global warming and create a new energy economy, John Edwards, released his plan to burn coal cleanly and store CO2 emissions safely. This is the first time an environmental issue has been introduced so prominently into a United States presidential campaign. It is a major breakthrough for climate change, and a strong indicator of the significance of the issue. Conventional coal-fired power plants generate half of the electricity, but cause a third of CO2 emissions in the United States, which is more than any other source. "Global warming is not an issue for the future," said Edwards. "It is a crisis that demands action from us today. We have the chance to create an energy revolution in our country, but if we're going to have that happen, we have to be willing to take action now." Other leading Democrat Presidential candidates, Hillary Clinton and Barrack Obama, have not made such a strong environmental or climate change statement. Barrack Obama says "We need to take steps to stop catastrophic, manmade climate change. If we do not act, the consequences will be devastating for future generations". He believes the U.S. must act decisively and creatively to reduce the emission of greenhouse gases, however, he has not matched the strength and urgency of John Edward's statement on CO2 emissions from coal. Obama is a cosponsor of legislation to establish limits on greenhouse gas emissions, by encouraging the market to determine how best to reduce greenhouse gases, rewarding cost-effective approaches through a system of tradeable allowances. Barack Obama worked with Senator Jim Bunning (R-KY) and others to promote research into conversion of Illinois-basin coal into clean-burning vehicle fuel, and using advanced technology to limit carbon emissions. Fuel produced from coal currently powers a third of South Africa's cars and trucks. In 2007, Obama passed an amendment to a budget package to provide $200 million to research reducing carbon emissions from coal. Clinton and Obama have not made such a sweeping statement to ban coal plants that emit CO2. Hopefully the position of John Edwards will propell the coal issue more prominently into the Presidential race. Senator Edwards made his call following Al Gore's testimony before Congress on March 21, when he called for ten steps to prevent global warming, including a moratorium on the construction of new coal plants that would not capture and sequester carbon. Many are hopeful that Al Gore may be waiting in the wings to join the Presidential race. If he does, the issues will certainly become prevalent. While Edwards' energy plan calls for investing in renewable energy and efficiency, he understands that the U.S. is likely to rely on coal for its energy needs for decades or even centuries. The Edwards energy plan will require that all new coal-fired plants are built with the required technology to capture carbon dioxide emissions, so plants built today will be able to permanently and safely store their carbon emissions tomorrow. He also committed to investing $1 billion a year in research and testing to jumpstart the means to store large amounts of carbon dioxide safely underground. Edwards has also proposed major investments in renewable energy and laid out ways to help Americans conserve energy. The United States has the technical resources to lead the other big coal users in the world with clean coal power generation. Climate scientists, some members of Congress, enviros, and progressive business leaders are putting up resistance that could change the way the coal industry wields its power. A ringleader is James Hansen, director of NASA's Goddard Institute for Space Studies and one of the world's top climate scientists, who says "There should be a moratorium on building any more coal-fired power plants". He has also declared that, by mid-century, any old coal plants that are not sequestering CO2 ought to be "bulldozed." The monsterous projections of coal generation are so alarming that coal has a questionable future as a major source of energy. Coal is the enemy, even more so than oil. World oil supplies will run out sometime in this century, however, it is quite easy to synthesize methanol and other liquid fuels from coal, so it could replace oil. There is sufficient coal still in the ground to last 300 years at least. This is more than enough to raise the concentration of CO2 in the atmosphere to rediculous levels, possibly as high as 10 times the preindustrial level. Is there a green revolution? A ban on the emission of CO2 from coal-fired power plants is a modest action compared to Sweden's policy to use no fossil fuels by 2020. Climate change is a threat to mankind and world civilization - the magnitude of the crisis exceeds any world war or natural disaster the world has ever known. A national leader who fully comprehends the crisis and takes the political risk of pursuing radical bold actions, will emerge with fame greater than any world leader in history. Coal is the best of fuels because it is plentiful and the least expensive. It has been the worst because it causes health-threatening smog, acid rain, atmospheric CO2, acid mine runoff, hazardous underground mines, and ground disturbing open-pit mines. Despite a greater awareness of damage to the environmental from mining and burning coal, its use has increased every year for 200 years. In 2005 the world used 5 billion tons of coal, and sent 10 billion tons of CO2 into the atmosphere. Coal-fired power plants are the largest source of anthropogenic CO2 in the atmosphere - 25 to 30 percent of the world's total. For many advocates of environmental protection, the liabilities of coal mining far outweigh the benefits of coal power generation, even if pollution controls mitigate smog and acid rain, and CO2 is sequestered or converted. During the last thirty years the emphasis of United States coal mining has shifted from the shaft mines of Appalachia and Pennsylvania, to the enormous surface mines in the western states, most notably Wyoming and North Dakota where 20 mines produce 400 million tons which is 40 percent of the nation's coal. In Appalachia in the eastern United States, about 600 strip mines remove 145 million tons a year, which is 15 percent of the national total. Some of these mines remove the summits of mountains to unearth coal, and in the process totally transform the landscape by moving rock and earth into the valleys below. Vegetation is lost, toxic coal sludge is left behind, and acid mine runoff pollutes waterways. 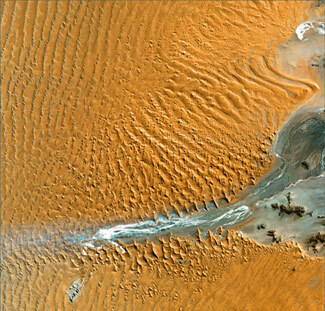 Image from space of the Namib Desert in southwest Africa, thought to be Earth’s oldest desert. Image ISS Crew Earth Observations and Image Science & Analysis Group, Johnson Space Center, NASA. A recent TIME magazine/ABC News/Stanford University poll shows that 85 percent of Americans believe global warming is probably happening, and 88 percent think global warming threatens future generations. The United States is at a critical time as worn-out obsolete coal-fired power plants built in the 1950s and 1960s need replacement. A new direction is necessary to prevent the construction of more than 159 power plants during the next 10 to 15 years that would use the old-fashioned polluting technology of pulverized coal. These plants are intended to provide electricity to 100 million homes. The biggest plants costing $1 billion, will have capacities of 1,000 megawatts which is enough to supply electricity to 900,000 homes. Each conventional plant would spill 6 million tons of CO2 a year into the atmosphere during its' operating life-cycle of 60 years or more. The problems of massive CO2 emissions from coal are staggering when considering global coal power generation, and particularly China and India which also have large coal reserves and major generating expansion plans. If conventional coal-burning power plants continue to be built without sequestering CO2, it will be lights-out for the planet. The United States emits nearly 5.8 million metric tons of CO2 into the atmosphere annually, which is 24 percent of the world's total. China has the next highest of 3.3 mt/year which is 15 percent of world emissions. China is projected to exceed United States CO2 emissions by 2020. China has already passed the United States as the world's largest consumer of coal, which fuels 90 percent of the country's electricity demand. China's rapidly increasing demand is expected to cause the expansion of generation capacity by 300,000 MW over the next 30 years. This expansion alone equals half of the United States present generating capacity. If old pulverized coal technology is used in new power plants in the United States, China and India, the impact of CO2 emissions on climate change will be frighteningly disastrous. If coal generation is unavoidable, then coal gasification could be its' savior to provide clean generation. Gasification of coal does not involve burning coal. Coal is heated to 2000°F in a sealed chamber, to which small quantities of steam and oxygen are added. Instead of combustion, dozens of chemical reactions break down coal in the gasifier into its' basic components. The gas that is produced, principally consisting of carbon monoxide, hydrogen, sulphur and nitrogen, is cleaned to become synthetic gas. Coal gasification has been used for some time. It provided fuel for German Luftwaffe aircraft during World War II. Syngas is produced at the Great Plains Synfuels Plant in North Dakota which was developed in 1980 to provide an alternative to natural gas. Syngas can fuel an Integrated Gasification Combined Cycle (IGCC) power plant. Two IGCC plants are operating in Europe, and two are operating in the United States in Wabash, Indiana and near Tampa, Florida. During 10 years of operation, Tampa Electric's IGCC plant is the most reliable coal-fired plant on the grid, producing the cheapest electricity on its' system. This stops the defenders of traditional coal generation, who say IGCC will be less reliable. The National Commission on Energy Policy has recommended the deployment of 10,000 to 20,000 MW of IGCC plants throughout the United States during the next ten years. The capture of CO2 from a conventional coal power plant is technically possible, however, it is impracticably expensive The separation of CO2 from the synthetic gas stream of a gasification plant is a simple chemical process that incurs little additional cost. Sequestration is tried and tested by the oil industry which uses a technique known as "enhanced oil recovery" to force oil and extend the life marginal wells. Gas is pumped into the aquifer to force the oil out. Enhanced oil recovery at PanCanadian Petroleum's Weyburn oil field in Saskatchewan, Canada will sequester 20 miilion tons of CO2 during the life of its' injection project. The gas is pumped through a 200-mile pipeline after it is captured from the Basin Electric coal gasification plant in North Dakota. The organic process of algae bioreaction provides great potential for CO2 mitigation. GreenFuel Technologies Corporation based in Cambridge, Massachusetts announced in November 2006 that CO2 has been successfully recycled from stack gases of the 1,040 MW Redhawk power plant in Arlington, Arizona, into transportation grade biofuel. GreenFuel’s Emissions-to-Biofuels™ algae bioreactor system creates a carbon-rich algal biomass with sufficient quality and concentration of oils and starch to be converted into biodiesel and ethanol. The technology uses safe, naturally occurring algae to recycle CO2 from the stack gases of power plants and other commercial sources of emissions. Algae are unicellular plants and, like all plants, they divide and grow in sunlight by photosynthesis, and consume CO2. “We estimate that this process can absorb 80 percent of CO2 emissions during the daytime at a natural gas fired power plant,” said GreenFuel CEO Cary Bullock. The GreenFuel field assessment program will now move into the next phase with construction of an engineering scale unit that will be completed in first quarter of 2007. The New Zealand company Aquaflow Bionomic Corporation based in Marlborough, announced in May 2006 that it produced its first sample of bio-diesel fuel with algae from sewage ponds. “We believe this is the world’s first commercial production of bio-diesel from algae outside the laboratory, in ‘wild’ conditions", said Aquaflow spokesperson Barrie Leay. By taking the waste product, Aquaflow can create bio-diesel and produce clean water, a process known as bioremediation. Dairy farmers, and many food processors could also benefit from recycling their waste streams that algae thrive in. Aquaflow is increasing production and testing its product in a range of diesel engines. “The market potential for this product is almost unlimited in the ‘Peak Oil’ environment we are in". “We expect to produce at least 1,000,000 litres of bio-diesel per year from Blenheim,” says Leay. Copyright © 2007 TerraNature Trust. All rights reserved.